After a bad streak of luck in Vegas, writer and thief Charlie Howard has retreated to Venice, having vowed to give up a life of crime to write mysteries full-time. But inspiration fails to strike. To make matters worse, Charlie's prized first edition of The Maltese Falcon flies out the window with a femme-fatale burglar. Blackmailed into returning to crime in order to get his book back, Charlie is catapulted into a plot that is more explosive than even he could have imagined. 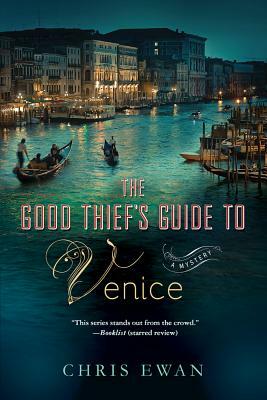 Chris Ewan's Good Thief's Guide Series travels to Venice in this "hilarious yet suspenseful" (Publishers Weekly starred review) caper. Chris Ewan, who lives on the Isle of Man, began his crime-writing career with The Good Thief's Guide to Amsterdam, which was called one the "best books for grownups" by Publishers Weekly and AARP The Magazine, and one of the best thrillers of the year by the London Times. The Huffington Post also named Ewan one of America's favorite British authors in a readers' poll. He is the author of the Good Thief novels and the stand-alone thriller, Safe House.